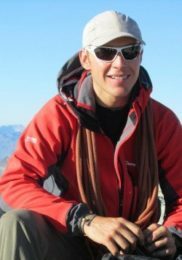 Euan, an IFMGA certified guide, offers private climbing courses in the UK for all levels. Join him and discover the best routes and climbing spots in Britain. If you are looking for climbing courses in the UK, I have the best programs for you. I can take you to any of the best British climbing routes, like to the Scottish Highlands, the Isle of Skye, the Lake District or Snowdonia. So join me and enjoy the best climbing courses in the UK, for all levels! I offer private courses in all aspects of summer mountaineering, climbing and hill walking. I’m also available for scrambling, navigation courses, guided rock climbing and National Governing Body qualification courses. The courses and programs I offer are for anyone interested in scrambling, hill walking or rock climbing. 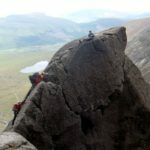 Easy rock climbs and classic scrambles such as North Buttress and Curved Ridge on Buachaillie Etive Mor, Afterthought Arete in the Cairngorms and Tower Ridge on Ben Nevis. 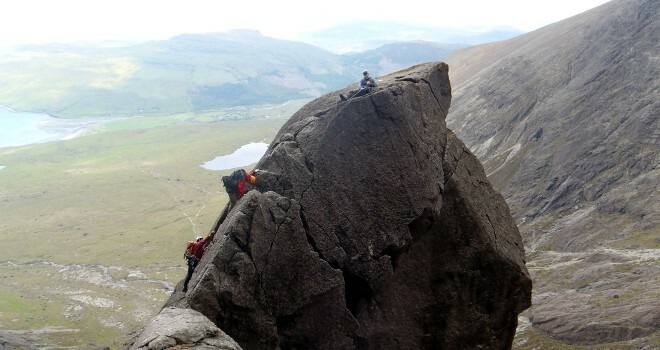 Classic scrambles such as Crib Goch, the Clogwyn Y Person Arete and Cneifon Arete in Snowdonia. Technical rock routes like Cemetery Gates (E1), Scratch Arete (HVS) and Gogarth (E1) in North Wales. So contact me if you are looking for the best guided climbing in the UK! We can plan a tour for one or several days. It will be my pleasure to be your guide. You can also check the 3-day hiking and climbing tour in the Cuilin in Scotland! I have been climbing for 23 years and instructing for over 19 years. I'm a fully qualified IFGMA Mountain Guide, full MIC and Technical Advisor for a number of local councils and other organisations. I'm based in Edinburgh which allows me quick access to the Highlands of Scotland and the Lake District. As well as climbing across the UK, I have climbed and skied extensively throughout Europe, Scandinavia and New Zealand. Please get in touch with me if you want to discover the mountains of Scotland or any other around the globe ! Euan was great and I would recommend him to others.